Food Trend: Detox. Photo: Twitter@/womenshealth. Spring is a time of rebirth. We’re shedding those chunky knit sweaters for v-neck tees and choker necklaces. Our hair is coming out of its perpetual bun and our we’re dredging our skin of dead layers and thick moisturizers. While we’re thinking about the next celebrity beauty trend, we need to also consider how to keep our inner workings clean so that our skin and hair will have a natural glow. In addition to celebrity fitness tips, these five food trend cleanses are what celebrities like Vanessa Hudgens, Amber Rose, and Hilary Duff use to boast about their hot celebrity bodies! Before you know it, you’ll feel confident enough to walk out in the latest celebrity styles. This food trend is all about bringing spring cleaning to your body! …Click to read more food trends from Cupid’s! Yet another celebrity break-up has hit Hollywood! What are some immediate ways to cope after a tough split? This celebrity couple was surprising, but it looks like things are getting steamy! What are some ways to know you have chemistry with someone? …Don’t miss the rest! Click here for some dating advice. A new celebrity couple could be forming and we couldn’t be happier! 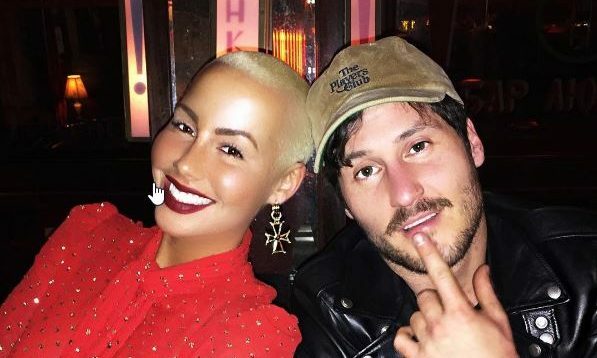 Amber Rose and Val Chmerkovisky have stepped out together holding hands looking happier than ever. A source shared with UsMagazine that they were initially, “just friends, but it’s recently turned into more and they have been hooking up.” A source close to Val, meanwhile, denies the romance and says, “They are just friends.” Despite the gossip, Chmerkovisky is trying to remain cool. “I can’t control what people think,” the asked about Rose. “I live my life and I try to live it, you know, the way I want to live it.” However, the recent sitings and social media flirting have people wondering if it could be developing into more despite his denials. This new celebrity couple isn’t shy about going public. What are some ways to know you’re ready to go public with your new relationship? …Want more celebrity news…click here! Celebrity divorce hasn’t stopped Amber Rose from showing her appreciation for ex-husband Wiz Khalifa. On Sunday, Rose posted a picture of Khalifa and their 3-year-old son, Sebastian, for Father’s Day. In her caption, praising Khalifa’s parenting, she wrote, “Happy Father’s Day to Sebastian’s Dad @mistercap Thee most Awesomest Dad in the World!!! (Besides my Daddy). Wish I could be home with you guys Today but have a blast and love each other up all day!” According to UsMagazine.com, the celebrity couple filed for divorce in 2014 after just over a year of marriage, but have always maintained a good relationship. This celebrity news has us realizing there are some good ex relationships in Hollywood after all. What are three ways to show appreciation for your child’s parent? Is Wiz Khalifa Bashing Celebrity Ex Amber Rose in New Song? Amber Rose has been in the center of the latest celebrity news, especially in the social media world, and now it seems she’s caught the attention of her celebrity ex Wiz Khalifa. According to UsMagazine.com, Khalifa’s verse in Juicy J’s new song “For Everybody” seems to reference Rose and her previous job as a stripper. Rose filed for a celebrity divorce claiming that Khalifa had cheated on her when they were together. Khalifa denied these claims. Khalifa and celebrity ex Rose have been going through a heated break-up. What are some ways to use music to cope with your split? The hits just keep on coming! According to UsMagazine.com, celebrity exes Wiz Khalifa and Amber Rose are partaking in a pretty heated Twitter battle, and there’s no end in sight. The pair filed for a celebrity divorce back in September, and it has been anything, but smooth since the split. The rapper tweeted out on Feb. 4 saying, “A woman who would do something to a kid to spite that kids father is a foul creature.” These celebrity exes have repeatedly used Twitter to express their celebrity break-up feelings for the world to see. What are some ways to keep your break-up gossip-free, unlike celebrity exes Wiz Khalifa and Amber Rose? What are some benefits of getting married at the courthouse? –…we’re not done! Click here to read more.